Last recipe I posted over here I mentioned our trip to France during holidays. Once back at home it’s tradition to visit family and share stories with each other. Since the kids were tired from traveling, my wife asked her parents over at our place. A good occasion to serve some aperitif with some light snacks. This grilled Naan bread was one of them, served with two different toppings and a nice gin tonic along with it. What does one need more in life? But why care if I had fun eating it? Hope you don’t mind. If so: please let me know then I’ll take the time for another run on these with good pictures and share them with you. Anyway more about the grilled naan bread. 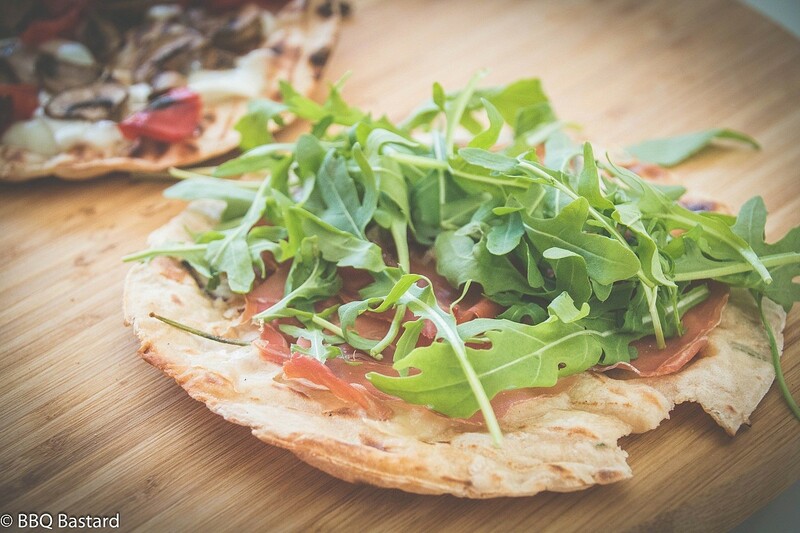 The origin of this “flatbread” recipe lies in Asian kitchen influenced by the Middle-east. It has a long history and is traditionally baked in tandoor ovens fired on wood. Naan bread is used in different ways. Traditionally it’s spread with Ghee and often used as a “spoon” to scoop other foods (stews for instance) or filled like a pita bread. Since it’s introduction in european kitchen it has been used in many different ways ranging from burgers to pizza. 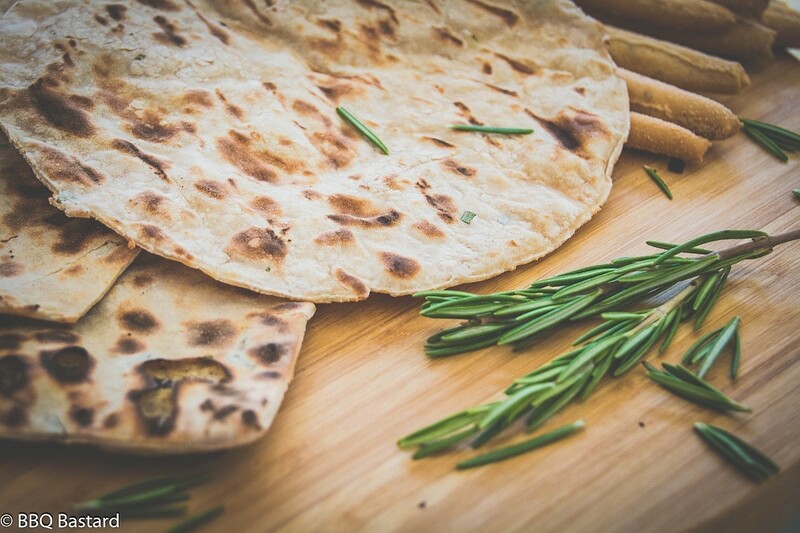 I don’t know if rosemary is a regular ingredient in Naan bread but these grilled once are spiced with rosemary too. Since we don’t own a tandoor I grilled them in my kamado thinking it would be closest too traditional cooking. Until I saw this article on cooking tandoori style in your kamado! Interesting read if you ask me! I simply must try cooking this way! As for the toppings of the grilled naan bread my wife went for more traditional toppings we use on toast over here. First one is served with italian prosciutto and arrugola. The other one is served with grilled paris mushroom, grilled sweet bell pepper and finished with buffalo mozzarella cheese. These ingredients match perfectly with the rosemary used in the dough. Maybe not the most traditional way of eating naan bread but after all a delicious appetizer. My parrents-in-law are honest people (or really really good at lying) and enjoy a good meal. They both approved the grilled naan bread with it’s toppings. It is something we’ll make again for sure! Thank you for taking a moment of time to check out this recipe. If you have any suggestions, advice or you decide to make these I would be happy to hear all about it. If you think this post was great enough to do me a pleasure, I’d be happy to see some shares to promote what I’m doing. Don’t forget to follow on social media if you want to stay tuned for more ;). 1. Start the fire for cooking as hot as you can. Open all vents and/or put your grid as low as possible. 2. Chop the rosemary very thinly and mix it up with the other ingredients. Knead until elastic and slightly sticky. 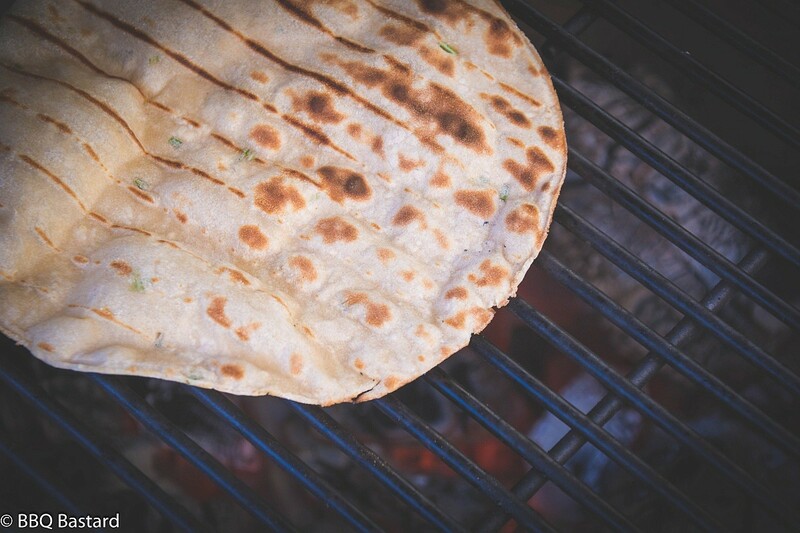 4. flatten the dough on a oiled surface to prevent from sticking.Make sure it's a flatbread so keep in mind the dough will rise a bit when on the grill. 5. Grill until the naan bread is nicely charred. 6. 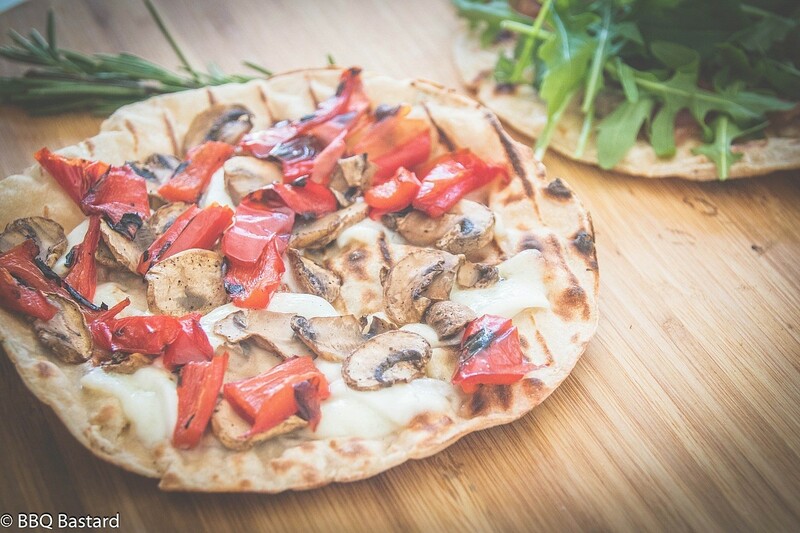 Grill the sweet bell pepper and mushrooms (you better do this before you start grilling the naan). 7. 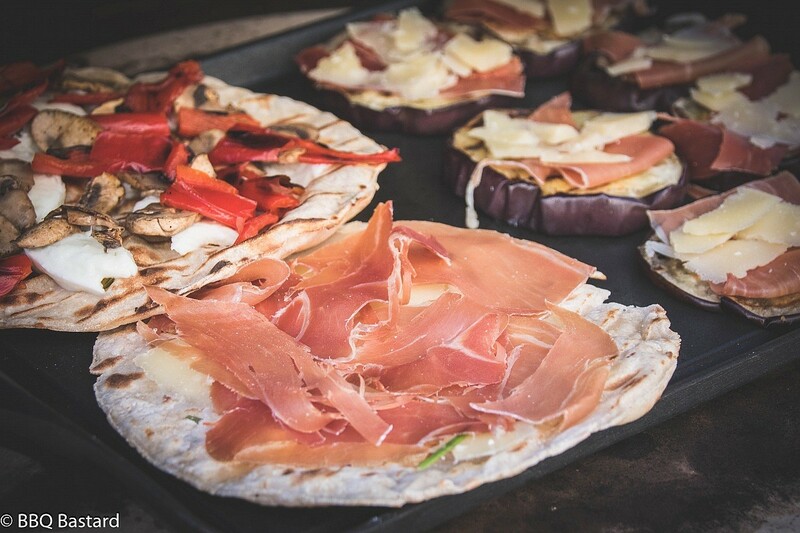 Add Prosciutto to the first one and mozzarella, mushrooms and sweet bell pepper to the other. 9. Finish the first one with arugola. 10: Both are ready to serve.